Charly Pignon graduated in 2005 from Alf ort National Veterinary School (France) and did his veterinary thesis on a wildlife conservation project in Cambodia. Then he worked in the wildlife rescue center in Alfort and Paris Zoo (la Ménagerie du Jardin des Plantes). In 2009, Charly Pignon completed an Exotic Medicine Internship at Tufts University. When he came back to France he created the Exotic Medicine Service in Alfort National Veterinary School. Charly is a Diplomate of the European College of Zoological Medicine (Small Mammals), a board member of Yaboumba (French association for continuing education in exotic and wild animals) and president of the Association of Exotic Mammal Veterinarian. 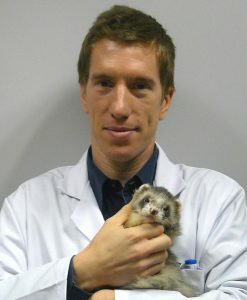 His current field of research are ear surgeries and orthopedic surgeries in small mammals, and blood transfusion in ferrets.